Getting back on the blogging track means getting back into the Dragon by Dragon articles. This week, I’m going to take a look at Dragon #55, from November 1981. This one has a really good beginning – a cover by Erol Otus. The best thing about the cover – I have no idea what that monstrous thing is. This, to me, lies at the heart of old school games – the freedom to invent something new every game, or to add all sorts of fun details to things old and well-known without the need to invent new mechanics. I think one of the downfalls of 3rd edition D&D was the attempt to standardize fantasy. Standardization may be important for “branding”, but it’s terrible for creativity. I think many corporations these days are cutting their own throats by pushing “branding” over creativity. Here we see the cleaving of the playership – one side needing a “serious” imaginary world and the other just needing a fun place to play for a few hours. I’m in the latter group, and of course love the Fiend Folio. It’s probably not a surprise that I don’t much are for Mr. Greenwood’s Forgotten Realms setting – though I mean no disrespect to Mr. Greenwood. He’s a hell of a creator, and deserves great respect in the gaming world. It just sounds like we’re looking for different things from our gaming. Guess that’s why I always liked the D&D rules better than the AD&D rules. I will indulge my sense of humor for reviews one last time here, with this peach from a second review of the Fiend Folio. The joy of writing for nerds. At least the reviewer was focusing on the big picture, and not nitpicking. Dinosaurs: New Theories for Old Monsters by Lawrence Schick raises the problem we still face with these creatures that we don’t face with fantasy monsters – we don’t know enough. We know more now than we did then, of course, which means we could well be revising monster stats for these beasts forever. This is why I prefer using dinosaurs in my games as though they were fantasy monsters based on what you got in old movies … with just a dash of what we now know (the potential for brilliant plummage, for example) to make them weird. Gary Gygax has a nice article covering some of the peoples of Oerth. 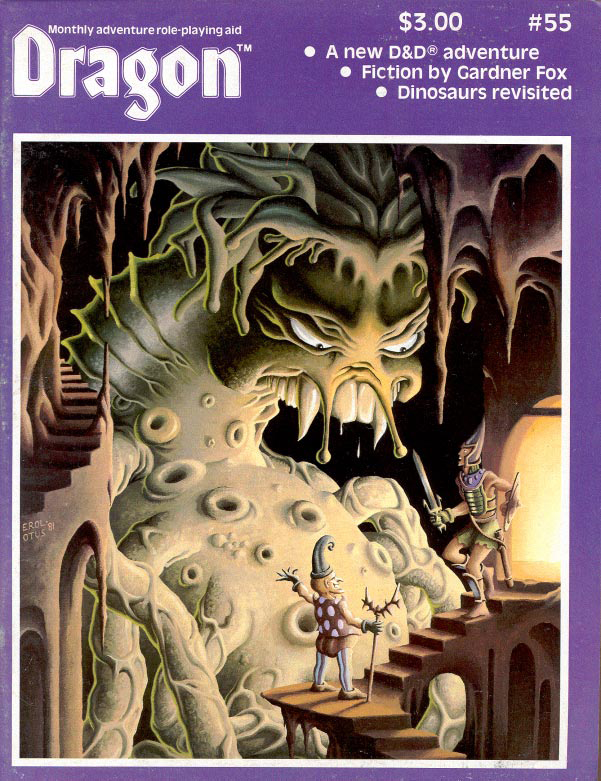 This was reprinted in the old Greyhawk boxed set, and I remember reading it there and thinking “Wow, I didn’t realize you could make this kind of thing up.” It was one of those “unknown unknowns” to me as a kid. I mean, the world is full of people, so I guess people in a D&D world will look like people in our own world, so you don’t really need to describe them. I had a lot to learn about the joys of fantasy. Katherine Kerr has a nice piece on Robin Hood (he has a price of 200 gp on his head, you know). She makes him a 12th level fighter, Chaotic Good, with some pretty high ability scores. 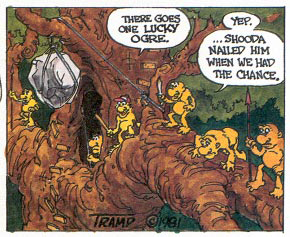 This brings up a thought – that D&D is actually better at depicting cruel reality than heroic fantasy in some ways. After all, when we try to model heroes of fantasy literature in D&D, we have to make them very high level and usually give them very high ability scores. Much of the “evolution” of D&D over the years seems to have been an effort to make it more amenable to fantasy heroes than the original game. Sounds funny to say this, given the presence of “heroes” and “super-heroes” in OD&D. Oh – I should add that Will Scarlet is an 8th level thief, Little John a 10th level fighter, Friar Tuck a 7th level cleric and the evil Sheriff (lawful evil, to be precise) a 6th level fighter. So begins another tale of Niall by Gardner Fox.This is good, old-fashioned pulp barbarian stuff, so worth a read for old school sorts like myself. Speaking of old school, this issue has a Basic D&D adventure called The Creature of Rhyl by Kevin Knuth (could this be him?). The adventure scores one old school point with reversed names – King Namreh (Herman) and Prince Laechim (Michael). It involves treking into the wilderness to hunt a giant monster and rescue the prince from an evil magician. My only quibble with this dungeon is the presence of some pretty decent magic items on the upper level without too much guarding it. This may be because there are a couple tough monsters lurking in the lower levels that have to be dealt with. There is a nice puzzle room here, and overall it seems like a good rescue mission sort of adventure. Pat Reinken (perhaps this fellow?) has a nice article on the tactics of escaping danger, mostly covering magic items that help you get away from danger in one piece. 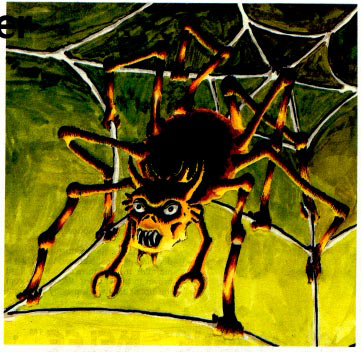 The Dragon’s Bestiary features the Devil Spider with awesome Erol Otus artwork, which makes sense since Otus invented the monster. The monster is predicated on trying to escape from sticky webs, in such a manner as to make for an exciting fight. It’s a tough monster, so don’t play with it unless you’re high enough level not to end up spider food. Jeff Brandt introduces the Surchur, which is quite a horrifying thing, humanoid with a mass of tentacles in place of a head. It’s a mid-level monster that doesn’t have many tricks up its sleeve, but which could still give a party lots of problems. Kind of a good Lovecraftian thug. Ed Greenwood presents the dyll in this issue, essentially a swarm of flying leeches. The final monster is Craig Stenseth‘s poltergeist, the spirit of chaotic gnomes from Limbo and Gladsheim sent to the Material Plane to spread chaos. Nice origin idea for them. 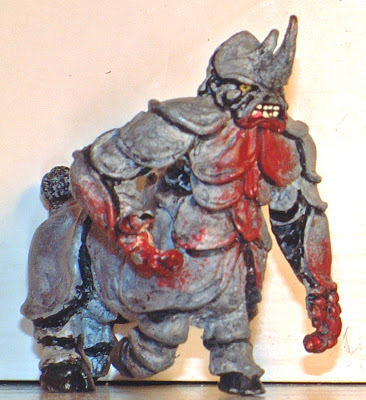 Speaking of monsters – the magazine reviews a cool miniature called the “gorillasaurus”, which is actually a hybrid of gorilla and rhinoceros (so maybe gorillaceros would have been a better name). The image is terrible in the magazine, but I found a good shot at the AD&D 2nd Edition Holdout blog that tells a good story about using it in-game. For comic fans, this issue has an early Snarfquest, a nice Wormy entry and a What’s New?. God bless – be kind to one another – and have some fun for crying out loud! Regarding “heroes”, ability scores, and OD&D: after years of chasing my own tail trying to figure out how D&D is supposed to handle genre emulation, I read the Chainmail rules and realized that the incoherence of D&D — its original sin that loosed incoherence into the system — was the doubling up of overlapping indicators of ability. Chainmail has Heroes and Superheroes, and OD&D maps that cleanly onto character level: a Hero is much stronger, faster, more skillful, more perceptive, luckier than an ordinary Fighting Man. Adding in ability scores on top of the level system makes a muddle of the whole thing. Gary was never a guy to use one coherent system when five overlapping and mutually contradictory systems could be used instead. Cool – not yet up to my first dragon, but I'm getting close to some of the issues I checked out from the library. Thanks for the nod in discussing The Creature of Rhyl. I wrote this adventure when I was in High School. It is my first publication! My pleasure – excellent to hear from you!